So what do we know about the new Coldplay album? Well it has a title, some artwork, and an official release date. 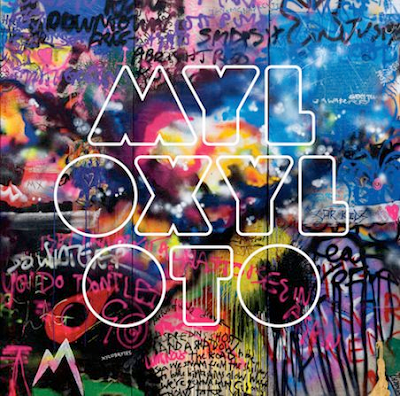 Mylo Xyloto (pronounced “MY-lo ZY-letoe”), is Coldplay's fifth studio album and is the follow-up to 2008's Viva La Vida or Death and All His Friends. The album is a mere two months away and has a firm release date of October 25th. As far as the tracklisting for the album, there is nothing set in stone yet and the band has not released any information on any of the new songs. What we do know is that they have released the Every Teardrop is a Waterfall EP which had 3 new songs on it. Also there are several other additional songs that they have played at festivals that are yet to be released in a studio version. So here is my best effort to speculate what exactly we will hear from one of the world's biggest bands (If you like em or not!). What we know for certain is that “Every Teardrop is a Waterfall” will most likely find its way on the album since it is the first single. The next single from the album is called “Paradise” and will be out September 12. The remaining songs are all still in question, so lets take a listen to some of the albums possible songs. Glad to see you've withdrawn your mindless titter (aka Album Reviews), posted earlier, about Coldplay's 'Mylo Xyloto'. Hard to understand why you would indulge in such thoughtless rubbish to begin with. Most 5-year olds have more intelligence. I have never been a Coldplay hater. I have to admit the latest effort of Every Tear Drop is a Waterfall was somewhat disappointing. But as far as Mylo Xyloto goes I am excited to see what Coldplay has to bring to the table. I downloaded the album yesterday and I must say, the songs will NOT disappoint. At the first listen, you might not be too fond but it grows on you.